Love the moment with City ZEN! Discover breathing, meditation and yoga practices to use every day for the holistic well-being of both body and mind. ★ Take care of yourself through exercise: Nike’s collections are perfect for your spare time activities. ★ Allow yourself a treat... perhaps one with all the nutritional benefits of Venchi’s 100% dark chocolate bars. ★ If you still have things on your mind at night, stop and meditate, even for just five minutes. It’s even better when you’re snuggled under an Etro blanket. ★ Break your routine! Travel, discover new things and let yourself experience new adventures. Visit the Samsonite boutique and choose luggage for your next trip, whether it’s a city break, an adventure or a relaxing weekend away. ★ Remember to walk and exercise, don’t sit down all the time! With Jimmy Choo’s pumps you will certainly feel like walking – try them on in the boutique. ★ Smell your favourite scent, wear it or spread it through a diffuser. Perhaps Caleffi’s pomegranate air freshener will inspire your senses ahead of spring. ★ Turn off your phone half an hour before going to sleep and put one hand on your stomach to feel your breath and to help you rest well – with Frette’s pyjamas sweet dreams will be ready to welcome you. Have you seen the new arrivals in the boutique yet? ★ Take your eyes off the screen and look around. Look at the sky, a plant, nature… but don’t forget sunglasses to protect yourself from UV rays: take a look at the new Ray-Ban® models in the GrandVision by Avanzi boutique. ★ Drink! Heaters and electronic waves from your laptop dry out your skin, so make sure you always have the perfect cream with you. You can find it in The Cosmetics Company Store. ★ Protect your immune system with a ginger, honey and lemon herbal tea – a magical mix for your health. Taste it at Villano. Breath is life: it brings oxygen to the whole body and conscious breathing increases lung capacity and concentration and reduces stress. Sometimes we unconsciously hold our breath and slip into apnea – the cessation of breathing. To find awareness of our breath once again is to return to ourselves, to find our centre again. As apnea is a freezing of the diaphragm, it can be released by returning to a focus on abdominal breathing. Breathing with the abdomen, more deeply, brings us back to a state of quiet, presence and tranquillity. People sometimes feel that to meditate you need a lot of free time and complete silence, because the presence of noise, without focus, can make us feel distant and lost. However, meditation techniques can actually help us to rediscover concentration, creating a shield to protect from external noise and bringing attention to the present moment. A simple exercise to help you retain awareness, without allowing the noise around you to interfere with your emotional state, is to concentrate on your breathing. In particular, bring your awareness to the area between your upper lip and nostrils, focusing on the air that enters and exits the nose. 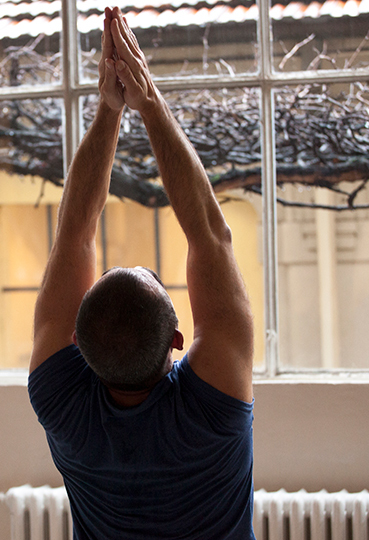 The practice of yoga involves not only complex poses on a mat, but also small exercises. It only takes a few minutes to do some exercises that can adjust posture, release tension and make the body feel healthier and more agile. In contemporary life, as we spend a large amount of time on smartphones and computers, we often suffer from back pain. But a simple exercise can help us to prevent and overcome this pain. Sitting in your chair, stretch your chest forward and extend your arms back, bringing your shoulder blades together, closer to the middle of your back. For a counterpose to balance out this movement, bend forward, rounding your shoulders. Repeat at least once an hour.